The Rav was the official mohel at Staten Island Hospital for many years. Anyone with biographical information is asked to please send it in. See CONTACT page for details. Chanina Schiff the long time gabby to the Gerer dynasty, any relation? Rav Akiva was my Uncle. 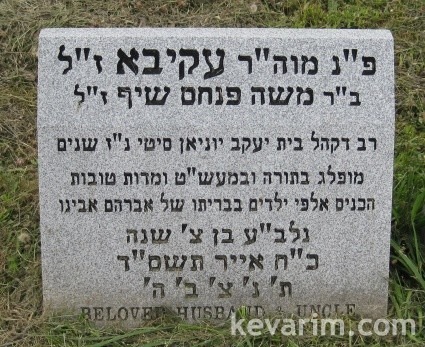 His kevar is in Washington Cemetary in Brooklyn NY in his father-in-law’s Marcus family plot. Learned in the Mir Yeshiva in Shanghai during the War and married Cecile (Zisel) Marcus. In his later years when the Sanz kollel moved in to Union City he would give shiurim there. Rav Akiva had hoped to be buried in Har Hazeitzim but changed his mind when things in Israel became unsafe near there and was concerned that visitors would be harmed going to the kevar. I remember Rabbi Schiff since I learned to walk. He was my shul’s rabbi – cong. Beth jacob in union city nj. Gave me bar mitzvah lessons. Had a simple apartment on the top floor of an apt building on 3rd st, union city. We grew up at Beth Jacob, and have many fond memories. We particularly remember Rabbi Schiff’s heartfelt brucha during Saturday morning kiddish. It always seemed to make the taste of the kichel and herring, sweeter. Was he related to a long-time teacher at HANC named Akiva Schiff, who lived afterwards in Rishon LeTzion? I don’t recall rabbi schiff having been related to anyone in the us. He escaped from europe with fellow students in the famous mirrer yeshiva. Ive never heard him mention family. My gfather, albert balin, suggested ge was here alone. His wife Cecil (sp) came from the marcus family which I remember as being large. There is a very strong affiliation with Sanz, he was a local rov who welcomed the Klausenberger Rebbe and helped arrange for the old institutions of Union City (such as the Jewish Community Center) to be transferred to the chassidishe community for a nominal charge.